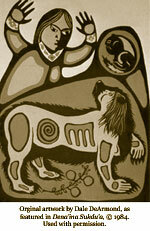 Dena'ina has a long tradition of storytelling. As in other cultures these stories were passed down from generation to generation as part of oral tradition long before they were written down. This is true of most of the world's great literature. The classical Greek and Chinese texts which we know today in their written form began millennia ago as part of oral tradition. Efforts to record Dena'ina literature in written form began in earnest only in the twentieth century. Some of this was written down in English translation only, as in Osgood (1937). Later, after a practical orthography was developed, Dena'ina literature was written in Dena'ina with accompanying English translation. Other recordings have yet to be transcribed. Together this body of recordings is a testament to Dena'ina literary heritage. Dena'ina literature takes many forms and covers a wide range of subjects. Much of the literature is rich in animal imagery, but the themes addressed are complex. As Richard Dauenhauer has noted, Alaska Native literature is not children's literature. As with any of the world's great literatures, Dena'ina literature requires some effort to appreciate. In this section you will find some short stories which have been transcribed and translated line-by-line with accompanying audio. Click on a title to view in the menu to the left and listen to the story. Or see the index of stories on the Dena'ina Sukdu'a page.